Lake Ontario's best sport fishing message board just got upgraded! A special thank you goes out to all the dedicated LOU members for making this board the best sport fishing board around! Support LOU's Sponsors: Be sure to check out the latest news, deals, events, products and services offered by our fine sponsors. Thank you for supporting those who support us! This forum is for ALL LOU Professional Members to openly discuss everything Lake Ontario and Fishing related. 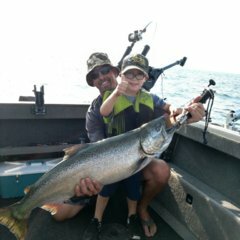 Lake Ontario discussion, Pen rearing projects/fish stocking, fishery news, general fishing questions and just about anything else regarding Lake Ontario fishing. South Shore (United States) New York Fishing Reports. Here you will find where the hot bite is and how to get them going. This section of the message board is only viewable by Lake Ontario United registered members. North Shore (Ontario Canada) Fishing Reports. Here you will find where the hot bite is and how to get them going. This section of the message board is only viewable by Lake Ontario United registered members. Instant Fishing Report (Lake Wide). Live from the top charter captains on Lake Ontario, these reports are up to the second daily! Over 700 miles long, "the river" is home to a wide range of species and breath taking scenery. Suitable for both novice anglers and seasoned professionals, this world class fishery offers anglers the opportunity at trophy Smallmouth & Largemouth Bass, Walleye, Pike, Musky, Panfish and much more. Today Lake Ontario sports more fishing tournaments than it has ever before in its history. From memorial & charity tournaments all the way up to some of the most competitive professional tournaments found on the Great Lakes. Post your tournament, show, event and seminar details details here for free! The voice of LOU members. Be heard and make a difference on regulatory and legislative issues. Find out more about the latest issues facing Lake Ontario, who to contact and where to send comments, concerns and petitions. New to Trout & Salmon trolling? Don't be afraid to ask a question about anything! The LOU community is filled with some of the most experienced sport fishermen this lake has ever seen. Dicussion on what lures, equipment or techniques are hot (or not) out on the big lake. Also you will find product reviews and new product updates. Want to now what that lure looks like that you hear mentioned on the vhf? Here you will find pictures and nicknames for all those hot lures we use out on the big lake. PLEASE keep this section for photos with name & brief description only. This forum is to exchange ideas on how to setup your boat for sport fishing & ask all those boat and marine electronics related questions. Recipes, Cooking What You Catch or Hunt - How to cook your catch to a mouth-watering perfection. Bon Appetit! 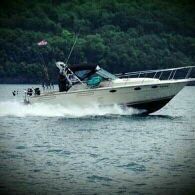 Photos of on the water, boats, and fish. Its super easy to post all your pictures from your adventures out on this great lake. Videos from our adventures on the water, of our boats, and of course - the fish! Its super easy to post all your videos from your adventures on the water. Dedicated forums for clubs, groups and associations around Lake Ontario related to fishing and hunting. If you are interested in getting a forum listed here, please contact us today and we will be happy to set one up for you. Team up with other LOU members and go fishing together. Save on gas and add two extra rods to your arsenal! Post Date, Time and Location of trip along with how many extra seats you are looking to fill. The famous sport of Ice Fishing (Season: December through March) - forum open to talks about tip ups, jigging, safety, equipment, hot spots, fishing reports and the warmest clothing on earth. No boat required. Walleye fishing in New York and Ontario, Canada. Caught around the clock 24/7, this species is one of the most popular game fish around for both sport and table fare. Fun fighting, aggressive toothy predatory fish. Share your tips, lures, techniques, location, pictures and fishing reports for musky, pike, and tigers here. From Chautauqua Lake to the St. Lawrence River - let us know how the toothy bite has been! America's most popular game fish - Largemouth, Smallmouth, Striper, Spotted, White & Black Bass. Bass fishing reports, tournaments, techniques, tackle and where the hot bass bite is. Yellow Perch, White Perch, Crappie, Bluegill, Pumkinseeds. The species of fish most of us got started on at a very young age and never outgrew or got tired of catching. Information on Lake Ontario rivers, streams and creeks, such as fish reports, LOSA meetings and tributary regulations. Comics Corner is where you will find the comedian in a lot of the Lake Ontario United members. As a general rule we are a "family", so we tend to share jokes and some outrageous pictures with Photoshop enhancements. Duck, Geese, Pheasant, Turkey, Crows, Brant, Snipe, Rail, Gallinule, Woodcock, Swan. Deer, Bear, Moose, Elk, Caribou, Squirrel, Rabbit, Raccoon, Bobcat, Coyote. Feedback and reviews about Gun, Bow, Ammo, ect. This forum is for discussions and reviews about hunting equipment. This forum is not a classifieds section. The selling and/or trading of guns and ammo is strictly prohibited on this website.